70% of organizations have a presence of BYOA and many expect the trend to increase over the next 5 years, according to a recent global study by Edge Strategies and LogMeIn. There is an enormous disconnect around the scale of BYOA and there are vastly different approaches to managing and monitoring BYOA today. Are you in control of BYOA at your organization and is your strategy built out to keep your IT environment secure while promoting employee productivity? 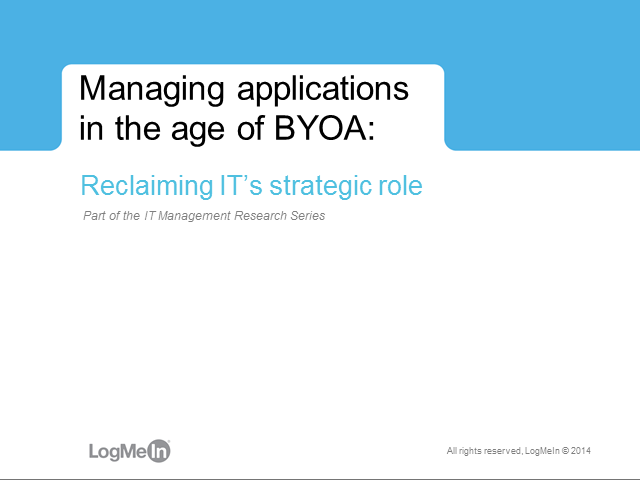 Nearly 1,400 IT professionals globally provided insights into the state of IT Management in today’s “BYO” workplace. In this webinar, we’ll shed light on the impact of the increase in cloud applications and the Consumerization of IT and provide the key steps IT pros can take to embrace and manage this new reality. IT service providers are underestimating the scale of the “bring-your-own-app” trend by 7X. On average, employees are bringing 21 apps into businesses today, often without the knowledge or approval of business leaders, let alone the control of their managed service provider. Often, MSPs are hesitant to manage cloud apps due to concerns for security of data and corporate information in the cloud, or a lack of control of managing these applications. This is a trend that cannot be ignored, and service providers that get out in front of the trend will not only help their clients maintain productivity with today’s empowered workforce, but can also monetize their business. Simply Secure management of data, devices and apps. LogMeIn understands the IT challenges facing SMBs and the MSPs that serve them. Our suite of solutions, including Cubby enterprise, Central and AppGuru enables intuitive, secure management of data, devices and apps.